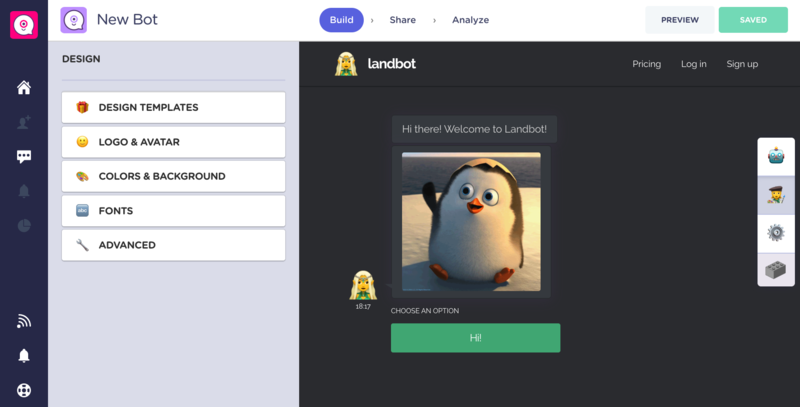 In the Design section, we can customise our Landbot 'to the infinity and beyond' with more than 20 variables to make it look unique. Real-time changes. Every change you make using the left menu will be shown in real time on the right side of the screen. So, if you're making some changes using, let's say, the Custom Style editor, and you notice no changes, something might be going wrong! Saving. The app will auto-save your changes every time you move from one section to another to make sure you don't lose any edits, so keep that in mind. Preview. The right side of the screen contains a fully interactive landbot so you don't need to click preview to test the flow along with the design edits. Hexadecimal colors. All color-related options allow you to add your own hexadecimal color code to make sure you can fully replicate your brand image in your landbot.